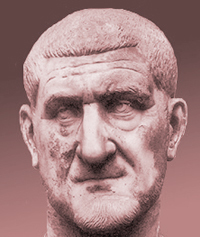 Maximinus I was considered the first of the so-called soldier emperors. His reign marked the end of the Severian dynasty and is commonly thought of as the starting point of the era referred to as the 'crisis and decline' or the 'Crisis of the 3rd Century'. The death of Severus Alexander was also the symbolic death of the pampered prince in his luxurious palace who had never seen the battlefield, the end of the principate system first introduced by Augustus. This was a time of crisis, constant warfare, troubles on the borders, and unceasing internal conflict and it called for a new breed of emperor. Pedigree mattered less than military credentials thus most emperors would now be required to be generals. Like Maximinus, emperors would be made and unmade by the legions. During the crisis, civil war was a constant as it was not uncommon to have many different men claiming the imperial title at any given time. Most of these men reigned only for a short time and were either murdered by their own men, by rivals, or killed in battle. Even as the crisis abated and and a semblance of stability was restored, the transformation of the emperor as a general would remain as almost all future emperors would be required to be both statesman and general and the imperial court would forever after be a highly centralized chain of command with the emperor-general as the supreme authority. Most sources seem to agree that he was from Thrace and that he came from very humble beginnings. Most other information regarding his youth such as him being a shepherd as a young man is at best unsubstantiated rumor and conjecture, at worst completely fabricated. "He was in any case a man of such frightening appearance and colossal size that there is no obvious comparison to be drawn with any of the best-trained Greek athletes or warrior elite of the barbarians." "He was of such size...that men said he was six inches over eight feet in height and his thumb was so huge that he used his wife's bracelet for a ring. Other stories are reported almost as common talk — that he could drag wagons with his hands and move a laden cart by himself, that if he struck a horse with his fist, he loosened its teeth, or with his heel, broke its legs." Needless to say, the common thread of truth would be that Maximinus was a conspicuously large and very powerful man. There are many anecdotes of his feats of strength and his early career under Septimus Severus and Elagabalus but most likely he spent his early career holding down a variety of different military appointments. Of course a man of his physical characteristics would certainly draw attention where ever he went and stories about a giant will inevitably circulate. From drinking a whole amphora of wine and eating 40 pounds of meat in one sitting to racing and defeating the emperor Septimus Severus (the emperor on horseback, Maximinus on foot) then, without rest, to wrestle and defeat seven men at once, the stories about Maximinus are many. Most are unsubstantiated and may just be mythological fabrications but they illustrate how he was viewed by many down the ages as almost superhuman in his physical prowess. "He discharged his trust extremely conscientiously, earning great popularity among the troops because he did not confine himself only to teaching them what to do but also took the lead in all the tasks.... So the young men, of whom the greater majority were Pannonians, admired Maximinus' courage and despised Alexander for being under his mother's control...They reminded themselves of the eastern disasters due to his procrastination and how he had shown no sign of bravery or enthusiasm when he came to Germany." The hardened veteran of the legions commanded their respect and admiration while the pampered young prince did little to win their loyalty. It wasn't long until they began to plan the removal of Alexander to replace him with a soldier they felt was more fit to run the war and who had proven himself many times over to be a brave and capable soldier and commander. It is not known whether Maximinus had any previous knowledge of their plan but Herodian states that as the troops lined up to be inspected before training, they threw the purple imperial cloak over him and proclaimed him their new emperor and soon moved against Alexander. The exact details of Alexander's death is not known, Herodian paints him as a good prince who attempts to rally troops who desert him and finally dying in his tent clinging to his mother weeping and blaming her for his misfortunes. What is known for sure is that Alexander was abandoned by his troops and soon after, he and his mother were killed and those loyal to him either escaped or were killed as well. 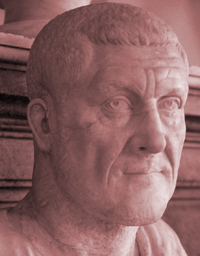 Maximinus wasted no time in turning his attentions to the upstart German tribes but not before quickly suppressing plots that had already formed to remove him. First by the ex-consul Magnus to have disloyal soldiers destroy the bridge that allowed Maximinus to return across the Rhine; the other an uprising by disgruntled soldiers who accompanied Alexander from the East and who championed the recently dismissed provincial governor Quartinus as a rival emperor. "The emperor took charge of the battle in person with great bravery. Maximinus took the lead by plunging into the marsh on horse-back (even though the level of the water came over the horse's belly), and killed many of the barbarians that resisted." His example of bravery and skill in battle is said to have inspired his troops to fight and win the day even though they faced a larger force in hostile terrain. After this victory he returned to Pannonia to winter and to plan the "total defeat and subjection of all the German barbarian tribes as far as the ocean." He soon directed his forces against the Dacians and Sarmatians north of the Danube but the continual war was becoming a drain on the treasury. To his defense he was fighting to secure the crumbling borders of Rome but the dwindling treasury and heavy handed tactics used to raise more funds only served to further agitate the aristocratic families who already resented what they saw as a common barbarian holding imperial power. Resentment turned to open rebellion as the proconsul of Africa in Thysdrus, the 80 year old Gordian, was proclaimed emperor in 238 with the support of the senate in Rome. Gordian, who seemed a reluctant usurper, lasted no longer than three weeks before a senator in Nummidia named Capelianus, who was loyal to Maximinus and hostile towards Gordian over a previous dispute, marched on Gordian and his son Gordian II in Carthage. Capelianus's experienced troops easily bested the the hastily organized forces of Gordian under the command of his son. In the end, Gordian II was killed in battle and his father hung himself with his belt. Maximinus was resolved to punish the disloyal senate and the senate was resolved to remove Maximinus from power naming two senators, Pupienus and Balbinus, as co-emperors. Maximinus and his troops marched towards Rome but they found themselves under supplied and drawn into a protracted siege of the city of Aquila who refused them entrance and aid. Disgruntled and undersupplied his troops turned on him. They killed Maximinus and his son and Caesar Maximus, took off their heads and sent them to Rome. He was most likely in his mid to late 60's when he died, his son was probably no more than 20. Pupienus and Balbinus would not reign for more than 99 days being hacked to death together by the praetorian guard who would proclaim the young Gordian III, grandson of Gordian I, as emperor. History is unkind to Maximinus who would later be referred to by the racial epithet 'Thrax' (meaning the Thracian), painting a portrait of a tyrannical, cruel, and uneducated barbarian. In truth he served most of his life as a loyal soldier in the legions and he spent his three year reign on campaign, never having stepped foot in Rome, fighting back the ever growing enemies of an empire in crisis. In the end, Maximinus would simply be the vanguard of what would soon become the norm, the soldier Emperor and the decline of aristocratic senatorial power over a military who would become all important to the continued existence of the empire, who stood between Rome and those who would destroy her.